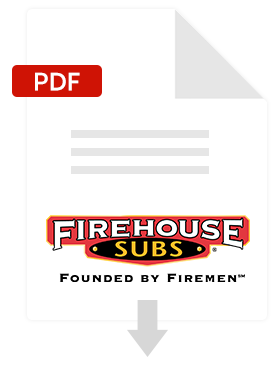 Firehouse Subs is a fast casual restaurant chain with a passion for Hearty and Flavorful Food, Heartfelt Service and Public Safety. Founded by brothers and former firefighters Chris Sorensen and Robin Sorensen, Firehouse Subs is a brand built on decades of firefighter and police service, steaming hot subs piled higher with the highest quality meats and cheeses and its commitment to saving lives through the creation of Firehouse Subs Public Safety Foundation. Firehouse Subs consistently ranks No. 1 among fast casual brands in the categories of food quality, friendly service and taste and flavor. Fill out the form below to download the suucess story right now.